Since I the place I am living is only walking distance to Downtown east Ehub, New York New York no doubt is a regular dining place for me and my hubby. My hubby loves their Premier Steak ($24.90). It might be abit ex compare to the steak in Swensson, but somehow it's worthy. Somehow they manage to grill the steak in a special way where you can feel the crunchy-ness on the skin layer, but yet juicy and tender inside. And their Rosselie Spring Chicken (whole @ $15.90 or half @ $11.90) worth for the value if non-big eater ladies are dining together. But if NYNY will offer more sauce for this dish, then it will be better. Mushroom with roasted vegetables ($8.90) is nice too as if gave me different texture to my flavour cause you manage to eat some cooked vege like aubergine and courgette with those raw lettuce. Not to forgget about their garlic vinegette sauce are my all time favourite! Thumbs up for their service as well despite of crowd during the weekend peak hour! Went to E! Hub with my close colleauges, not knowing where to have our dinner. We decied to choose New York New York. We order a lots of stuff to be share with among 6 ladies. 2 soup, 4 main course, 1 free starter and 2 desserts. 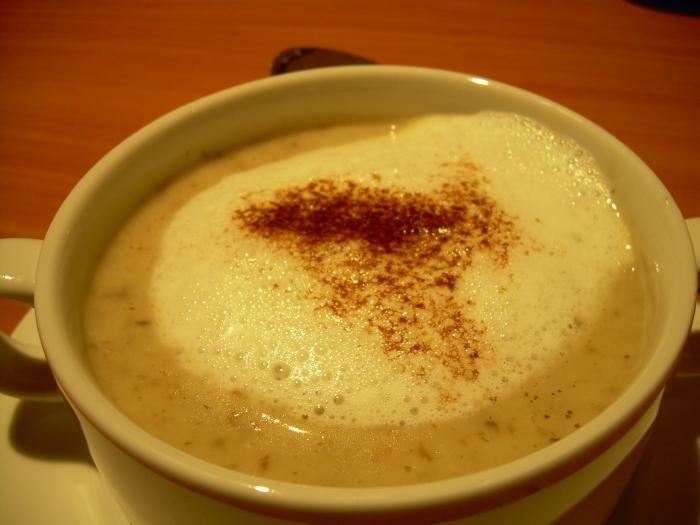 2 Roasted Mushroom Cappucciino ($5.90 per bowl) Cream of roasted mushrooms with flothed milk and topped with a sprinkle of coco powder. The soup is actually quite special to me. Not too bad. I love mushroom soup but it will be good if there is more mushroom inside. 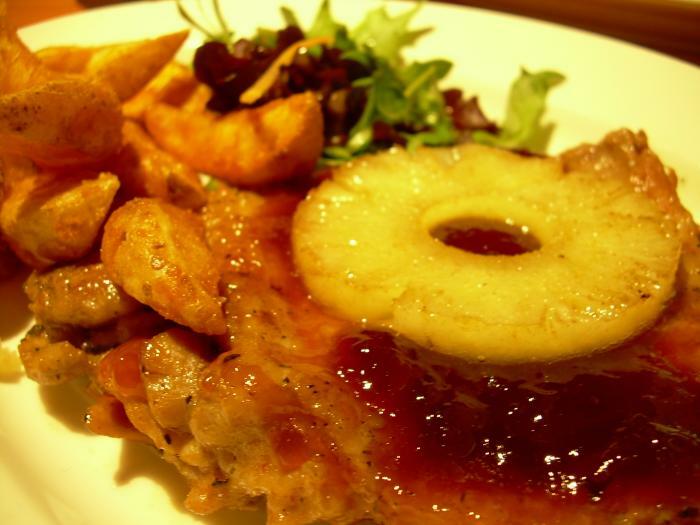 1 Hawaii Teriyaki Chicken Chop ($13.90) The prefect combination of topical pineapple and delious teriyaki sauce on grilled chicken thigh. It comes with lots of geens and wedges. The chicken is tender and goes well with the teriyaki sauce but I feel the chicken need to marinate more that will be nice. 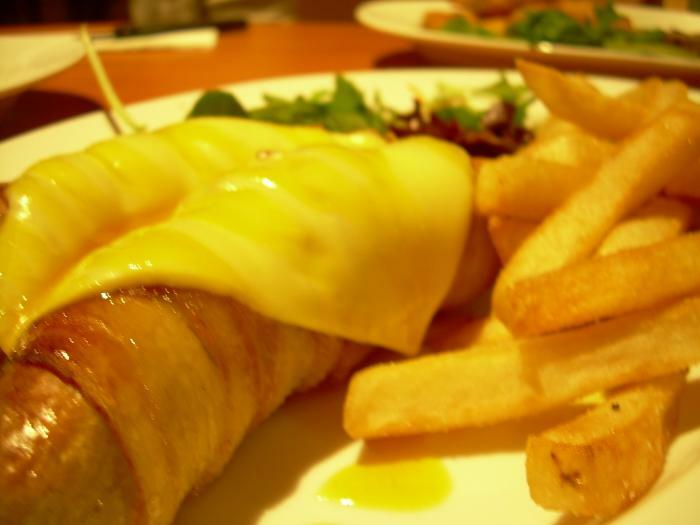 2 Brats Wrapped in Bacon and Cheese ($12.90 per plate) Bratwurst sausges wrapped with bacon and cheese. It comes with lots of greens and french fries. It taste sausges taste sweet, can taste that they have put honey on top of it. The dish is not bad. 1 Jiggy Piggy ($12.90) Pork Chops come with lots of greens and wedges. 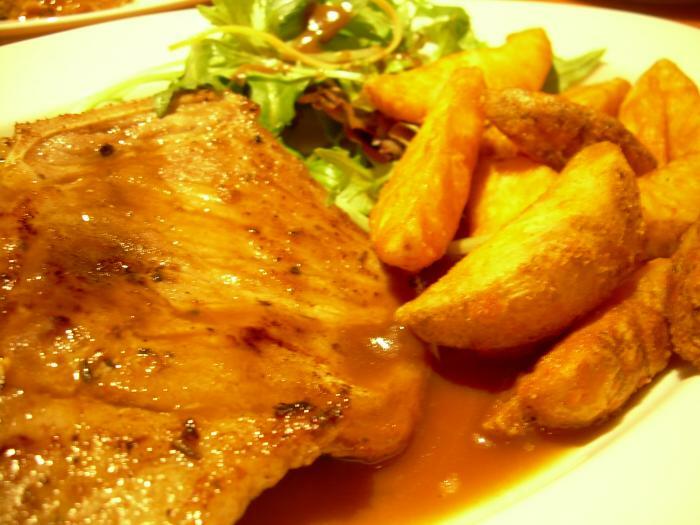 The pork chop is not tender. It will be good if it soft and tender. As for the greens and wegdes is good. 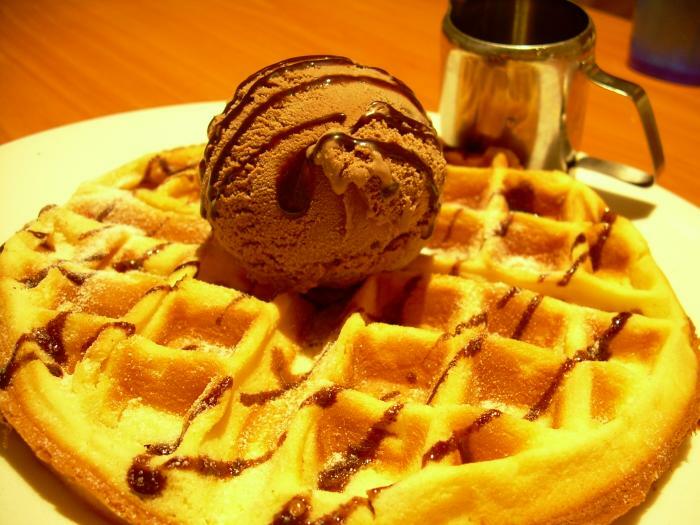 1 Waffles with chocolate and ice-cream ($7.90) The waffles is crispy on the outside and soft in the inside and it hot. It goes well with the chocolate ice-cream. 1 Mudpie with Chocolate ice-cream ($7.90) Lots of hot chocolate fudge over a chocolate pie. The chocolate fudge is too sweet for me. The pie doesn't taste good to us. I don't recommend it. We got a free basket of wedges as we spent above $30 by using DBS credit card. The service was not bad. Btw the candy floss is free flow, you can help yourself with it.